Gargoyles Clothing is a retail site featuring a huge selection of clothing, shoes and accessories. 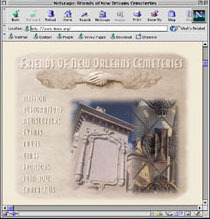 Friends of New Orleans Cemeteries is a Charity group that restores historic tombs. The ARVLFC (Anne Rice Vampire Lestat Fan Club) is the offical fan club for Anne Rice. Alaset Diversified Systems is an ecommerce service provider. Progrip Racing is a manufacurer of dirt bike equipment. Danish Inspirations is an on line furniture store. 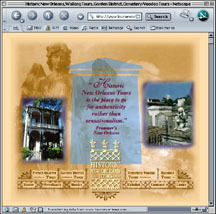 This site was designed by our Art Director, Mary Dugas, and developed in conjuntion with EMCI and Vogel Group Advertising. This site has everything you need to know about buying a car. The main interface buttons were designed by us. The Don Mcgill Toyota/Audi/Porche site was designed 5 years ago to work in conjunction with a touch screen Kiosk that could be set up in their showroom, a mall, etc... It could tell a customer if a particular model was on the lot, or let them buy it on line. 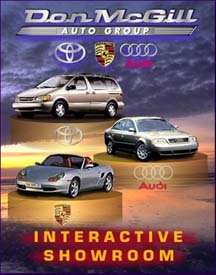 Recently, Toyota has begun offering this service to their dealerships, so this site is no longer on line. To the Left is an example of the Kiosk touchscreen.